The quest for vintage sound breeds the ultimate high-gain rock tone. The BOSS Waza Amp Cabinet 212 is specially crafted for compatibility with the Waza Amp Head, and is a combination born of the same innovative spirit used in pursuit of the ideal rock sound from the beginning of the rock era. While the Waza Amp was born in the spirit of historic innovation, it offers expressiveness ranging from vintage to Waza Brown with modern expandability and reliability. BOSS breaks new ground in the amp market to realize the ideal rock sound. A speaker is an indispensable and critical component for guitar amplifiers that provides a “voice” for guitar playing to reach the world. The speaker used with the early stack amp is one of the most highly regarded speakers by top guitarists. 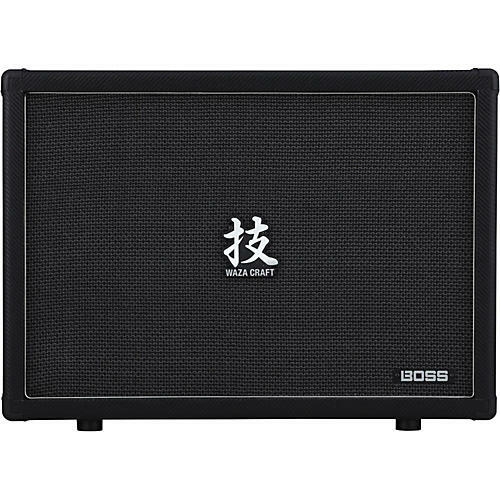 In the process of developing the Waza Amp, BOSS engineers tested numerous speakers in combination with many components and configurations of amp circuitry, and found no other speaker that is suitable to bring the ideal rock sound to life. Its transparent high end and vivid clarity have attracted many artists and engineers involved in the Waza Amp project. However, the speaker has only 20 watts of power-handling capacity.